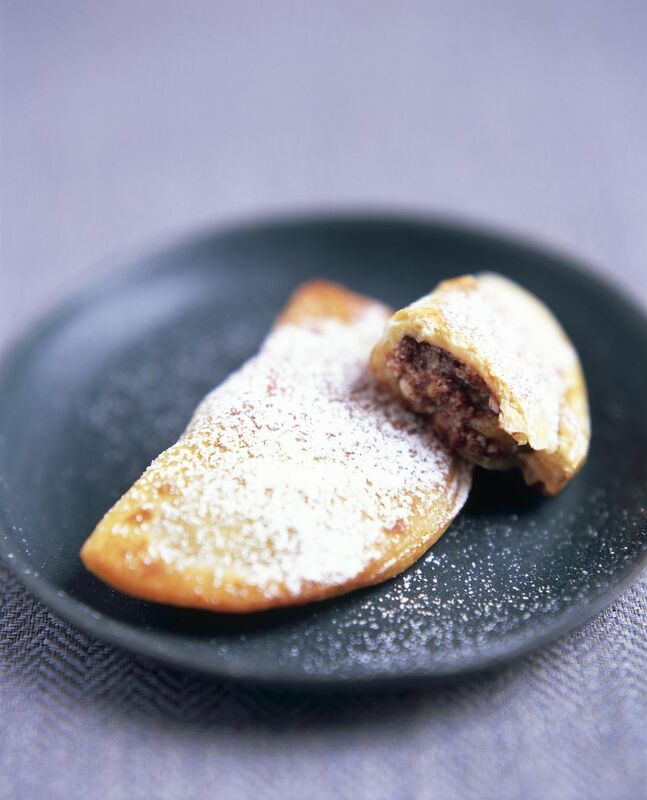 This is an unusual Italian Carnevale-time treat in that it is baked, rather than fried. They are relatively quick and easy to make, and the golden-brown crescents of baked dough, made with olive oil and white wine, have a luscious cannoli-like filling of ricotta cheese (visit this page for instructions on how to make your own homemade ricotta!) flavored with cinnamon, rum and lemon zest and studded with candied fruit and chocolate chips. These are also a great idea if you are craving cannoli but don't want to bother with frying the shells! 2/3 cup finely diced mixed candied fruits (e.g., orange peels and/or lemon peels, cherries) -- for a less-sweet (though also less-authentic) treat, you could also use dried fruit, such as dried cherries, figs or dates. Grease a baking sheet with butter. Form the flour, granulated sugar and baking powder into a volcano-shaped mound on a large work surface. Pour the olive oil and wine into the crater of the volcano and use your hands to gently mix the ingredients into a dough. Knead it gently until smooth and supple. Roll the dough out into a thin sheet and then cut out 6-inch diameter circles. (You can gather the leftover scraps after cutting out the circles and re-roll them to cut more circles). Now, prepare the filling: mix the ricotta, granulated sugar, cinnamon, candied fruit, egg and egg yolk, lemon zest, chocolate chips and rum. Mix well with a wooden spoon until well blended. Place spoonfuls of the filling just below the center of each of your dough rounds. Using a pastry brush, gently brush a little water around the edges of each dough circle. Fold each circle in half over the filling to form a half-moon shape, making sure that the edges line up, and press firmly with your fingers along the edges to seal. Optional: Use the tips of the tines of a fork to press a crimped pattern into the round edge of the ravioli. Lightly beat the egg white and brush each raviolo with the egg white glaze. Bake until golden brown, about 20 minutes, then lightly dust with the powdered sugar. Serve at room temperature.